Unlike Carl Lewis and Daley Thompson, Derek Redmond is not a name that conjures up memories of Olympic gold medals. But it is Redmond who defines the essence of the human spirit. Redmond arrived at the 1992 Olympic Summer Games in Barcelona determined to win a medal in the 400. The color of the medal was meaningless; he just wanted to win one. Just one. He had been forced to withdraw from the 400 at the 1988 Games in Seoul, only 10 minutes before the race, because of an Achilles tendon injury. He then underwent five surgeries over the next year. This was the same runner who had shattered the British 400-meter record at age 19. So when the 1992 Games arrived, this was his time, his moment, his stage, to show the world how good he was and who he was. Derek’s father Jim had accompanied him to Barcelona, just as he did for all world competitions. They were as close as a father and son could be. Inseparable, really. The best of friends. When Derek ran, it was as if his father were running right next to him. The day of the race arrives. Father and son reminisce about what it took for Derek to get to this point. They talk about ignoring past heartbreaks, past failures. They agree that if anything bad happens, no matter what it is, Derek has to finish the race, period. 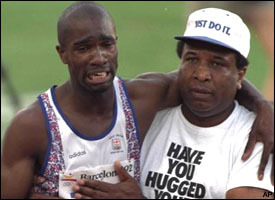 With the help of his father, an injured Derek Redmond completed his race in the 1992 Olympics. The stadium is packed with 65,000 fans, bracing themselves for one of sport’s greatest and most exciting spectacles. The race begins and Redmond breaks from the pack and quickly seizes the lead. “Keep it up, keep it up,” Jim says to himself. Down the backstretch, only 175 meters away from finishing, Redmond is a shoo-in to make the finals. Suddenly, he hears a pop. In his right hamstring. He pulls up lame, as if he had been shot. “Oh, no,” Jim says to himself. His face pales. His leg quivering, Redmond begins hopping on one leg, then slows down and falls to the track. As he lays on the track, clutching his right hamstring, a medical personnel unit runs toward him. At the same time, Jim Redmond, seeing his son in trouble, races down from the top row of the stands, sidestepping people, bumping into others. He has no credential to be on the track, but all he thinks about is getting to his son, to help him up. “I wasn’t going to be stopped by anyone,” he later tells the media. On the track, Redmond realizes his dream of an Olympic medal is gone. Tears run down his face. “All I could think was, ‘I’m out of the Olympics — again,’” he would say. Then, in a moment that will live forever in the minds of millions, Redmond lifts himself to his feet, ever so slowly, and starts hobbling down the track. The other runners have finished the race, with Steve Lewis of the U.S. winning the contest in 44.50. Suddenly, everyone realizes that Redmond isn’t dropping out of the race by hobbling off to the side of the track. No, he is actually continuing on one leg. He’s going to attempt to hobble his way to the finish line. All by himself. All in the name of pride and heart. One painful step at a time, each one a little slower and more painful than the one before, his face twisted with pain and tears, Redmond limps onward, and the crowd, many in tears, cheer him on. Finally, with Derek refusing to surrender and painfully limping along the track, Jim reaches his son at the final curve, about 120 meters from the finish, and wraps his arm around his waist. “I’m here, son,” Jim says softly, hugging his boy. “We’ll finish together.” Derek puts his arms around his father’s shoulders and sobs. Together, arm in arm, father and son, with 65,000 people cheering, clapping and crying, finish the race, just as they vowed they would. A couple steps from the finish line, and with the crowd in an absolute frenzy, Jim releases the grip he has on his son, so Derek could cross the finish line by himself. Then he throws his arms around Derek again, both crying, along with everyone in the stands and on TV.